Institutions can now request that the Author / Contributor Type column heading be changed to different terminology. Please submit a support ticket to make a request. For institutions utilizing the Thomson Reuters Web of Science API, additional data fields in the API are now available to be mapped to FACULTY180 for data imports. For institutions utilizing Thomson Reuters metric data in vitas, Times Cited are now hyperlinked to the corresponding Thomson Reuters Web of Science articles. When an evaluation is submitted or the due date for an evaluation has passed, the link to the evaluation is now removed from the Dashboard. If the due date is later extended, the evaluation link will re-display on the Dashboard. Upon clicking the Delete icon for a vita template, a warning message now displays confirming that you wish to delete the vita template. The FACULTY180 API now allows attachments to be downloaded by the requester. The AACSB (Table 2-1) Report has been optimized for increased performance. The Profile Report now contains a Terminal Degree column for the Degrees activity. This indicates if a faculty member has received a terminal degree or not. 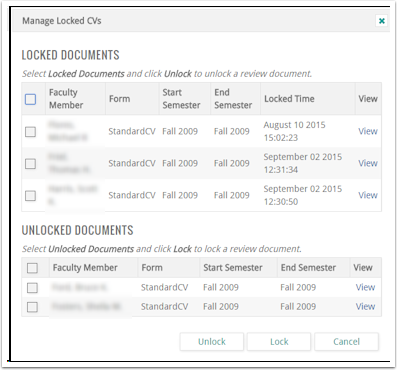 Administrators are now able to unlock and relock vitas that were locked previously for an evaluation. In the Evaluation Management section, click Manage Locked Vitas. The Manage Locked CVs dialog box opens. Specify the documents to be locked or unlocked, then click either Unlock or Lock.